I have a 7-year-old hunter, very athletic, but at the canter around a turn, or as I turn, he swaps his lead behind (behind only). I try to keep a slight inside bend and use my inside leg to the outside rein. It works well most of the time, but as soon as I let go, he will most of the time swap behind, going to the right more so than the left. What exercise can I do fix that? Is it a weakness or a balance/engagement issue? Thanks so much. Just as people are right handed or left handed, horses are right leaded or left leaded. 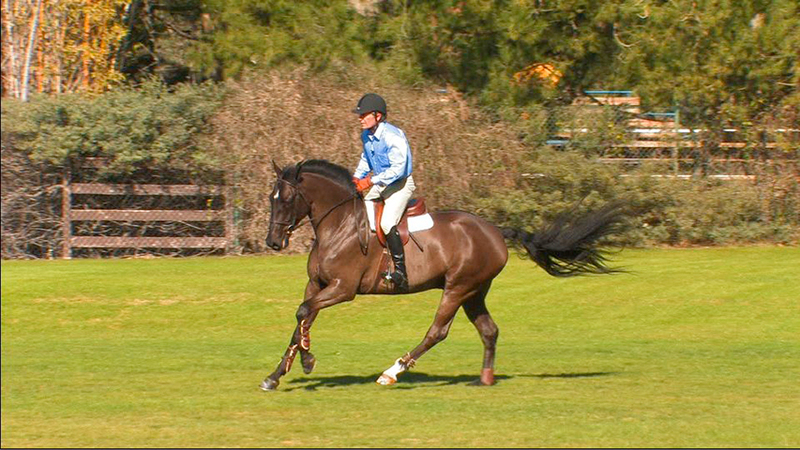 Cross-cantering (one lead in front and the other behind) is not a natural gait for a horse. You will rarely see a horse in a field at the cross-canter. 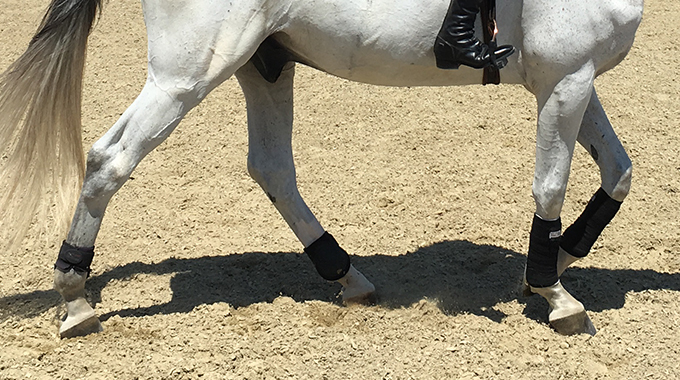 A horse that steps off its lead is going from a balanced gait to an awkward one and it’s much more than a tie-breaker–it really is a major fault in both the hunter and equitation rings. The first thing I do with a horse that steps off its lead, is to check soundness. I don’t mean to say that the horse needs to be head-bobbing lame. Injecting a mix of steroids and hyaluronic acid into the hocks and/or stifle joints is considered normal maintenance for the show horse. 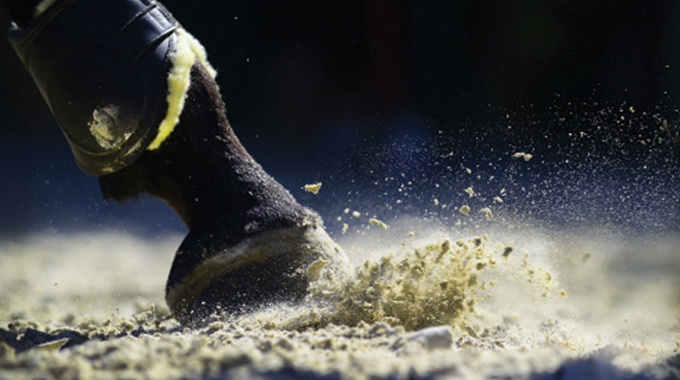 Generally, this will take care of the horse that loses or steps off its lead in the corners. If this doesn’t help, don’t despair. There are several other places to check. Many times a long or weak-backed horse can get very sore in its sciatic area. Shock wave therapy and injections may be necessary to alleviate the soreness, but a dedicated fitness program that targets the hind end is also helpful—long trot sessions and hill work come to mind. If the hind end is addressed and the problem persists, the next area to check is the horse’s neck. As someone who has dealt with back and neck issues for the last 30 years, I can attest to the debilitating pain that can accompany inflammation in these areas. Almost any horse will develop some degree of arthritis or remodeling of the joints throughout its show career. A good chiropractor, acupuncturist, or masseuse can work wonders for pain relief. All of this being said, the strongest soundest horse in the world can be pulled off its lead by the rider. 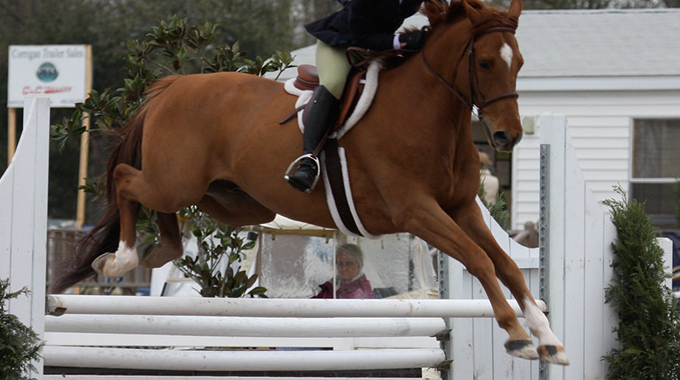 The stiffness the rider feels when turning their horse can be caused by a variety of reasons. However, attempting to correct the stiffness by trying to neck bend the horse is asking for more problems. Once physical issues are eliminated, the most common cause of a horse losing its lead is overbending on one rein or the other. When a horse grabs a rein, the first reaction is to grab back. That, in turn, causes the horse’s neck to turn in that direction. Without an opposing rein for balance, the horse is actually being thrown off balance. 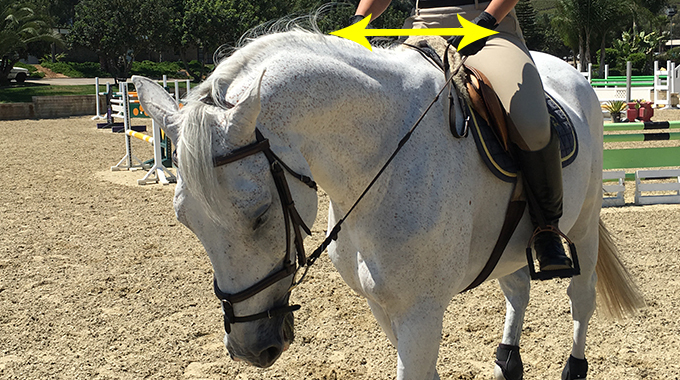 See the exercises to correct this riding fault below. The easiest is using a driving rein. The driving rein is used with the right hand to the right side of the mouth, and left to the left side, with the rein held between the thumb and index finger. Another exercise I use involves holding the hands at either end of a stick. 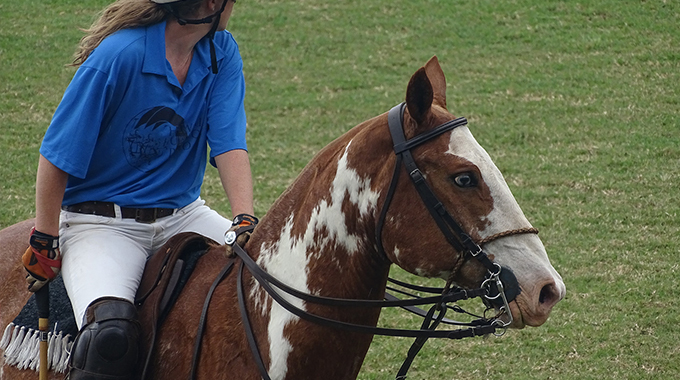 The stick must stay perpendicular to the center line of the horse. After you have mastered circles (more difficult than you might think), proceed to figure-8’s and serpentines. Jumping small jumps really helps the rider to feel the outside rein. Remember the outside rein is the primary balancing rein. Also, practice turning your horse with both reins in the outside hand. Finally, another great exercise for the horse and rider is the counter canter. Proper counter canter is a true test of balance and straightness. When tracking left on the right lead (and vice versa), the primary aids are left rein and left leg. The right leg is the inside leg and should maintain impulsion and bend. Counter canter is also extremely beneficial in developing the strength of the horse’s hind quarters. In short, a fit, well conditioned, well maintained horse ridden straight by someone who is aware of lateral as well as longitudinal balance shouldn’t experience difficulty holding a lead on a turn.